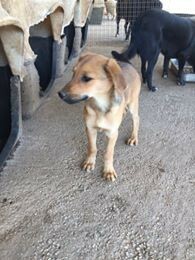 Meet pup Tria needs her home. born unwanted and unloved in Greece. She will be medium to large when grown. She is now safe and well and deserves a family of his own. She has only ever lived in a shelter so needs a family who can guide her through toilet training and basic guidance. It won..t take long. Adoption criteria applies. children over 4 yrs. and home check will be required. Email to see videos as the photos are not great.